Every year 22 million workers are at risk of losing their hearing from workplace noise hazards. Hearing loss disability costs businesses an estimated $242 million annually in workers' compensation. This is why OSHA is partnering with other agencies to offer a challenge to inventors and entrepreneurs: Help develop a technological solution to workplace noise exposure and related hearing loss. OSHA and the Mine Safety and Health Administration, in partnership with the National Institute for Occupational Safety and Health, have launched the "Hear and Now – Noise Safety Challenge." The competition is open to the general public. Idea submissions are due by Sept. 30. Ten finalists will be invited to Washington, D.C., to pitch their ideas to a panel of judges that will include investors and representatives of NIOSH and the U.S. Patent and Trademark Office. For details, read the news release. Four months after OSHA cited Material Handling Systems/MHS Technical Services for failing to provide workers with fall protection at an Addison, Ill., job site, a 42-year-old employee fell 22 feet to his death at the same site. OSHA cited the company for three egregious willful violations for exposing workers to falls following its investigation of the Feb. 9, 2016, fatality. OSHA also found that Material Handling Systems failed to determine whether walking and working surfaces could structurally support employees and allowed workers to use a combustible polyethylene tarp as a welding curtain, which created a serious fire hazard. OSHA cited the company for fall protection violations in October 2015 at the same jobsite and in 2014 for similar violations after an employee suffered serious injuries in a fall in Keasby, N.J. The company also received fall protection citations in 2009 in Oregon and 2012 in Florida. For more information, see the news release. OSHA cited GD Copper USA Inc. with two willful, one repeat, nine serious and two other-than-serious safety violations after the company exposed employees to safety hazards at its Pine Hill, Ala., facility. GD Copper manufactures tubing for heating and cooling systems, appliances, refrigeration and plumbing. Violations included: exposing workers to unguarded machine parts and equipment; putting workers in danger of falls due to missing safety rails; and exposing workers to electric shock hazards. The company was issued proposed fines of $196,900. Read the news brief for more information. A 25-year-old worker at a Rockmart, Ga., chicken feed mill was killed and five others hospitalized when an excessive accumulation of grain dust ignited, causing an explosion. OSHA inspectors issued 20 safety and health citations to JCG Farms of Alabama LLC, doing business as Koch Farms of Collinsville, for violations including exposing workers to electric shock hazards, and fire and explosion hazards; failing to train workers to recognize combustible dust hazards; and failing to implement an emergency action plan. The agency also issued citations to A to J Electrical Services and D. Sims Inc., contracted to perform maintenance work and housekeeping. Proposed penalties for the three companies total $112,600. Read the news release for more information. A 57-year-old worker performing maintenance inside a casting machine was fatally crushed when part of the machine, called the ram, moved. 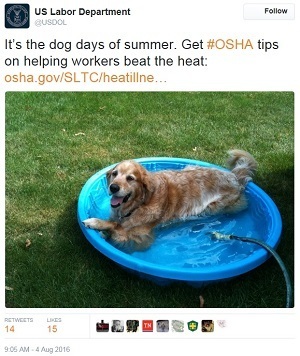 OSHA cited Stahl Specialty Co., an aluminum foundry in Warrensburg, Mo., with six safety violations including failing touse lockout devices, isolate all sources of energy in or to the equipment, and adequately train workers on proper lockout procedures. "An employee who had been with the company 40 years lost his life because his employer failed to follow safety procedures to prevent machine parts from moving during maintenance," said Todd Sieleman, OSHA's acting area director in Kansas City. The company faces $105,000 in proposed penalties. For more information, read the news release. IAn OSHA investigation found that hazardous materials cleanup contractor, Environmental Remediation Services Inc., exposed its employees to mercury poisoning and did not provide proper safeguards to workers doing mercury removal work at a Schenectady worksite. The inspection, initiated following several worker complaints, found that multiple employees inhaled or absorbed excessive levels of mercury vapor or liquid mercury through their skin and had symptoms consistent with respiratory mercury exposure. In addition, the company did not comply with requirements for protecting employees engaged in hazardous waste operations. OSHA cited the company for one willful and 13 serious violations and issued proposed penalties of $142,200. For more information, see the news release. The following are recent examples of enforcement cases from Iowa's state occupational safety and health program. For more examples of state and federal enforcement cases, visit OSHA's online enforcement penalties map. Iowa OSHA fined Iowa Premium LLC in Tama $92,500 after inspectors determined that the company exposed workers to fall hazards, pneumatic and electrical energy, and amputation hazards from unguarded gears, sprocket wheels and chains on the conveyor system. Iowa OSHA also issued 29 serious citations totaling $203,000 to Performance Contractors Inc. in Sergeant Bluff following a fatal incident in March. Inspectors concluded that the company failed to purge, flush and monitor a permitted confined space, exposing a worker to a fatal, oxygen-deficient atmosphere. The company failed to provide air monitoring equipment needed to fully test inside the permitted space, did not provide any rescue equipment or procedures for summoning rescue and emergency services, and failed to ensure that the workers were trained to understand the hazards experienced during confined space entry. OSHA is accepting nominations for individuals to serve on the Federal Advisory Committee on Occupational Safety and Health. The 16-member committee advises the secretary of labor on safety and health issues related to federal employees. The agency is accepting nominations for three labor and three management representatives to serve three-year terms, effective Jan. 1, 2017. Nominations are due Oct. 31, 2016. Read the Federal Register notice for submission details. When a worker dies from falling off a roof, being struck by lightning, or becoming caught in machinery, the cause is relatively easy to determine. But when buildings or machinery such as cranes collapse, it's more difficult to determine the cause of the incident. That's where OSHA's structural engineers come into the picture. Since 1989, OSHA's small team of structural engineers has investigated more than 100 structural collapses during construction involving worker fatalities and/or injuries. The current staff of four engineers is often engaged on multiple investigations or training to help employers, workers, construction engineers, project managers, and regulatory bodies identify problems in construction and design to help prevent future incidents, fatalities, and serious injuries. An article in Structure Magazine by Mohammad Ayub, Director of the Office of Engineering Services for OSHA, offers valuable insights into the office's first two decades, including preventative measures that structural engineers can take to prevent collapses and save lives. With more than 20 million young workers between the ages of 15 and 24, employers are reminded that they have a legal responsibility to provide a safe and healthful workplace for all their employees, regardless of age. OSHA's Young Workers webpage provides resources that include information on potential workplace hazards and testimonials from young workers injured on the job. Several state-run occupational safety and health programs have also begun initiatives to ensure that young workers return home safe and healthy each day at the end of their shifts. Kentucky: Tech Ready Apprentices for Careers in Kentucky prepares students for the workforce. TRACK provides pre-apprenticeship opportunities to high school students through existing programs offered at secondary tech centers across the state. Students in the electrical, welding, and carpentry fields are required to complete eight safety and health training modules. Indiana: This state is focusing on keeping young workers safe when they are driving on the job. The Indiana Department of Labor sponsored a contest for high school and college students to use their creativity and social media savvy to spread the message about the dangers of texting and driving. Vermont: The state's "Jobs for Youth" initiative helps at-risk youth ages 16-24 find employment by providing mentoring services, a workshop and a job fair. The program targets runaways, high school dropouts, and young people who have a criminal record. At the time of job placement, workplace safety and health requirements are discussed with both the employer and the young worker being hired. 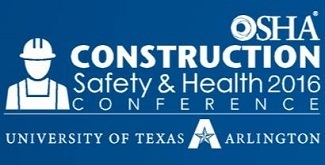 The 2016 OSHA Construction Safety and Health Conference in Irving, Texas (October 26-27), will provide participants with health and safety education and the latest industry techniques, trends, and new areas of research ― all focused on reducing injuries and illness in the construction industry. More than 400 industry professionals are expected to attend the two-day conference that will offer more than 50 exhibitors and over 35 breakout sessions. OSHA officials and other national agencies will be on hand to answer questions and provide information and resources. Among the keynote speakers, panelists and educators will be OSHA Assistant Secretary Dr. David Michaels. For more information, visit the conference website. The 8th Annual Safe Patient Handling Conference sponsored by the NYS Department of Labor, NYS Zero Lift Task Force, and Western NY Council on Occupational Safety and Health will be held at the Adam's Mark Hotel and Event Center in Buffalo Sept. 21-22. At the conference attendees will have an opportunity to select a learning track for their specific work situation. Each track will include lectures, workshops and hands-on equipment demonstrations from instructors who have established Safe Patient Handling Programs that have reduced worker injuries, decreased severity of injuries and provided better outcomes for patients. For more information and to register online, visit the conference website. Two John Elway automobile dealerships in Englewood and Greeley, Colo., used OSHA's On-site Consultation Program to help improve their safety programs. Their efforts to protect workers and establish a culture of safety were rewarded in March 2016 when the dealerships were accepted into OSHA's Safety and Health Achievement Recognition Program. For more information, see the success story. SHARP recognizes small business employers who have used OSHA's On-site Consultation Program services and operate an exemplary injury and illness prevention program. On-site Consultation offers free, confidential safety and health advice to small and medium-sized businesses in all states across the country and several territories, with priority given to high-hazard worksites. The service is a voluntary service, separate from enforcement, and does not result in penalties or citations. 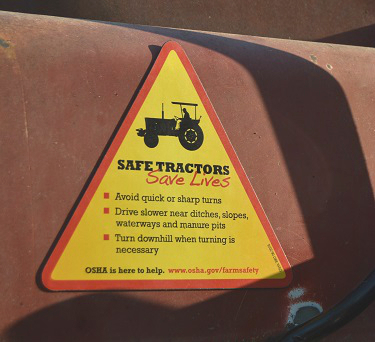 OSHA has created a magnet encouraging tractor operators to practice safe handling when in the driver’s seat. This magnet, available in English or Spanish and designed to be be placed directly on tractors, can be ordered from OSHA's website. A new addition to the OSHA's Fatal Facts series emphasizes how quickly methylene chloride vapors can reach life threatening levels when using common paint stripping products. This Fatal Fact sheet features the story of a temporary worker who died while using a paint stripper containing this hazardous substance to remove the coating from a bathtub.